Sun., March 18, 2018, 7 a.m. Remember drivers ed class, when instructors had their own brake if a student got careless? Small planes used for flight instruction have a similar setup: two controls for the brake, rudder, elevators and ailerons. But only one throttle, located between the two front seats. 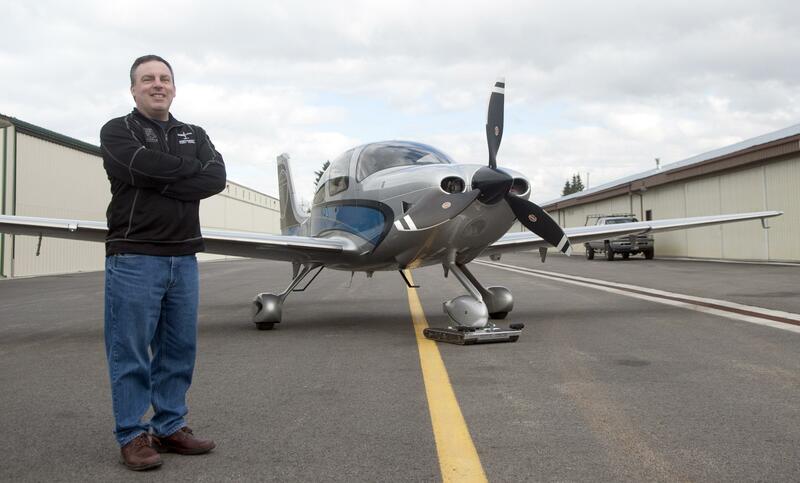 “Several years ago, I was flying with a younger kid,” recalled Dan Arch, chief instructor at Northwest Flight Service. “Very smart – a video gamer-type guy – but not the strongest of students. “We were practicing touch-and-go landings at Deer Park, and he wasn’t stable on one approach, so I told him to go around. “Instead of pushing the throttle up, he pulled it to idle, and the wind blew us off course. Small planes rarely make the news unless a pilot crashes one or makes an emergency landing. Business is taking off at schools like Northwest Flight Service at Felts Field , thanks to a strong economy and growing demand for pilots, from airlines on down. Minnesota-based aircraft manufacturer Cirrus recently named Northwest Flight Service the top training center among its 70-plus North American affiliates. During a recent interview, Arch discussed KC-135 tankers, two-way radios and the thrill of soloing for the first time. Arch: New Jersey, about 30 miles outside New York City. S-R: How old were you when you started flying? Arch: Sixteen. You can start training at any age. You have to be 16 to solo and 17 to get your license. S-R: Did anyone else in your family have a pilot’s license? Arch: My dad, but he quit flying before I was born. S-R: How much did your lessons cost? Arch: Probably around $7,000. My dad paid for most of it. S-R: What was your first job? Arch: I started working in a grocery store when I was 16. I’d earn about $100 a week, then spend it at flight school on the weekend. S-R: Do you recall the first time you soloed? Arch: Most pilots remember their first solo. In my case, I was doing touch-and-go landings when the instructor said, “Stop the airplane.” Then he got out and said, “Go do three by yourself,” and walked away. Going up on my own was thrilling – knowing I was in control, with no one to help me. I don’t think I stopped smiling the entire time. S-R: Any bad memories of early flights – close calls, terrifying weather? Arch: The good thing about being young and stupid is you probably don’t realize those situations. In college, I’d fly over downtown New York with airliners around, but I don’t remember anything scary. Part of it was being conservative – I didn’t put myself in risky situations. S-R: Where did you attend college? S-R: Did you have a career in mind? Arch: I wanted to be a pilot. I got a degree in economics but also joined ROTC my sophomore year, figuring I’d go into the military and pursue aviation that way. In 1991, six months after graduation, I entered the Air Force. For the next 16 years I flew KC-135s (refueling aircraft), and then my last four years I helped run 22 aero clubs on Air Force bases scattered all over the world, which got me back into small airplanes. S-R: What are aero clubs? Arch: They’re privately funded flying schools on bases. S-R: Did already having a pilot’s license when you joined the Air Force increase your odds of flying planes? Arch: It may have helped me get through the screening process. But no matter how many hours you have (flying), they train everybody as though they have zero. S-R: What did you do after retiring from the Air Force in 2011? Arch: My wife and I were living in San Antonio at the time. I was stationed at Fairchild from 2000 to 2008 and we loved it here, so we moved back and I started flying with Spokane Airways (which provided aircraft maintenance, flight training and aircraft charters at Spokane International Airport). When Spokane Airways shut down in late 2012, Bill Ifft, who already offered aircraft maintenance at Felts Field, decided to add flight training and asked if I was interested in starting a school. We opened Jan. 1, 2013, the day Spokane Airways shut down. S-R: Who, besides you, teaches students to fly? Arch: Initially we had a handful of instructors who came over from Spokane Airways. They were all young guys who went on to fly for airlines. Now I have a group of retired Air Force pilots and former airline pilots working with me, plus a bunch of younger guys getting the hours they need so they can move up to the airlines. S-R: How many students do you have? Arch: “Students” is a misleading word, because we have student pilots – people who aren’t pilots yet – but also licensed pilots working on their instrument rating or commercial rating, and pilots training for their biennial flight review. We had about 250 clients come through our door last year. We currently have around 80 pursuing some kind of certificate. S-R: What does it take to become a private pilot? Arch: Passion, plus time and money. S-R: How much does it typically cost to get licensed? Arch: The realistic number we like to give is anywhere from $16,000 to $25,000, based on the equipment you use and how long you take. S-R: Are there ways to save money? Arch: Yes – study. An airplane makes a horrible classroom, but it’s a great place to practice what you’ve learned on the ground. S-R: Do some people come here thinking they have a passion to fly, only to discover they’re terrified riding in small planes? Arch: Yes. We also get people who are terrified of flying and come here to overcome that fear. S-R: How has the business evolved since you opened five years ago? Arch: We’ve grown much bigger and faster than I thought we would. Our partnership with Cirrus Aircraft has been a big part of that. When we opened, there were only a couple of Cirrus airplanes in our region. Now there are at least 20. S-R: How many flight schools are there here? Arch: Besides us, the only school open to the general public is in Coeur d’Alene. They’re focused more on backcountry flying. We’re much bigger, with more equipment and instructors. There are also a lot of independent instructors around. S-R: What factors affect your business? Arch: Flying is discretionary, so the economy is a big factor. The recession really hurt flight schools. S-R: Are small airplanes getting easier to fly? Arch: Aerodynamics are aerodynamics. Newer airplanes have a lot more safety features, like the parachute-equipped Cirrus. But sophistication also adds complexity, so flying them isn’t necessarily easier. S-R: Your website mentions you teach drone-operating skills. Arch: Yes. About a year ago, the FAA said commercial drone operators had to be certificated, so we came up with a one-day class to teach people what they need to know to pass the FAA’s written test. The class costs $500 and includes books and the $150 test itself, which we administer. Arch: I love having good discussions with smart people – both clients and co-workers – on ways to improve things. S-R: What qualities do you look for when hiring instructors? Arch: Skills, of course. And patience. I remind them they were once students, and not everybody is where they are yet. S-R: Do you have women instructors? Arch: Currently, no. But we have in the past, and we just got a request for one, so we might hire someone part time just for her. S-R: What’s the hardest thing to teach beginners? Arch: Flying the airplane is actually the easy part. Knowing all the things you need to know to fly the airplane – from systems to regulations to weather – is the hard part. S-R: Are there any skills students typically struggle with? Arch: Talking on a two-way radio. Kids today can talk to six other people at once on their phone while also playing a video game. When you talk on a two-way radio, you have to press to talk, and when you’re talking, no one else can talk. It can be tricky at first. S-R: What’s the business outlook for flight schools? Arch: It’s tremendous. Airlines are hiring like crazy, and when airlines hire, that means all the lower levels – corporates, regionals – lose pilots. Our big challenge is hiring instructors, because we’re having to make them, which takes longer than just hiring an experienced instructor. S-R: Can someone with no interest in becoming a pilot arrange a ride? Arch: Absolutely. We give everything from introductory flights to a few lessons, so clients can get a taste for flying without actually getting their license. What’s funny is how many students quit after their first solo. All they really want to do is be able to say they flew an airplane – it’s that amazing an experience. Published: March 18, 2018, 7 a.m.